The volatility of bonds (especially short and medium dated bonds) is lower than that of equities ( stocks ). Thus bonds are generally viewed as safer investments than stocks. Convertible bonds: A convertible bond is a type of bond that the holder can convert into shares of common stock in the issuing company or cash of equal value, at an agreed-upon price. 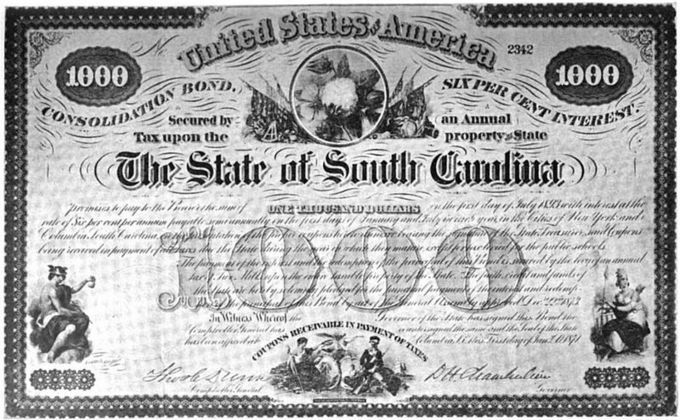 Zero coupon bonds: A zero-coupon bond (also called a discount bond or deep discount bond) is a bond bought at a price lower than its face value, with the face value repaid at the time of maturity. inflation-linked bonds: Inflation-indexed bonds (also known as inflation-linked bonds or colloquially as linkers) are bonds where the principal is indexed to inflation. They are thus designed to cut out the inflation risk of an investment. 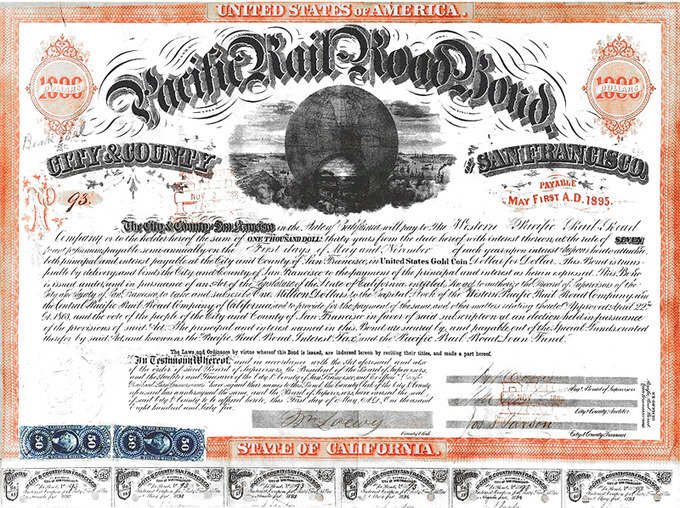 San Francisco Pacific Railroad Bond: A bond is an instrument of indebtedness of the bond issuer to the holders. It is a debt security under which the issuer owes the holders a debt and, depending on the terms of the bond, is obliged to pay them interest (the coupon). In addition, the issuer might have to repay the principal at a later date, which is termed the maturity. Bondholders also enjoy a measure of legal protection: under the law of most countries, if a company goes bankrupt, its bondholders will often receive some money back (the recovery amount), whereas the company’s equity stock often ends up valueless. Furthermore, bonds come with indentures (an indenture is a formal debt agreement that establishes the terms of a bond issue) and covenants (the clauses of such an agreement). Covenants specify the rights of bondholders and the duties of issuers, such as actions that the issuer is obligated to perform or is prohibited from performing. There are also a variety of bonds to fit different needs of investors, including fixed rated bonds, floating rate bonds, zero coupon bonds, convertible bonds, and inflation linked bonds. Reinvestment risk: The reinvestment risk is the possibility that the investor might be forced to find a new place for his money. As a consequence, the investor might not be able to find as good a deal, especially because this usually happens when interest rates are falling. Exchange rate risk: The exchange rate risk is a financial risk posed by an exposure to unanticipated changes in the exchange rate between two currencies. Bond: A bond is a debt owned by the enterprise to the bondholder. Price changes in a bond will immediately affect mutual funds that hold these bonds. If the value of the bonds in a trading portfolio falls, the value of the portfolio also falls. This can be damaging for professional investors such as banks, insurance companies, pension funds, and asset managers (irrespective of whether the value is immediately “marked to market” or not). If there is any chance a holder of individual bonds may need to sell his bonds and “cash out”, the interest rate risk could become a real problem. Bond prices can become volatile depending on the credit rating of the issuer – for instance if credit rating agencies like Standard and Poor’s and Moody’s upgrade or downgrade the credit rating of the issuer. An unanticipated downgrade will cause the market price of the bond to fall. As with interest rate risk, this risk does not affect the bond’s interest payments (provided the issuer does not actually default), but puts at risk the market price, which affects mutual funds holding these bonds, and holders of individual bonds who may have to sell them. A company’s bondholders may lose much or all their money if the company goes bankrupt. Under the laws of many countries (including the United States and Canada), bondholders are in line to receive the proceeds of the sale of the assets of a liquidated company ahead of some other creditors. Bank lenders, deposit holders (in the case of a deposit taking institution such as a bank) and trade creditors may take precedence. There is no guarantee of how much money will remain to repay bondholders. In a bankruptcy involving reorganization or recapitalization, as opposed to liquidation, bondholders may end up having the value of their bonds reduced, often through an exchange for a smaller number of newly issued bonds.